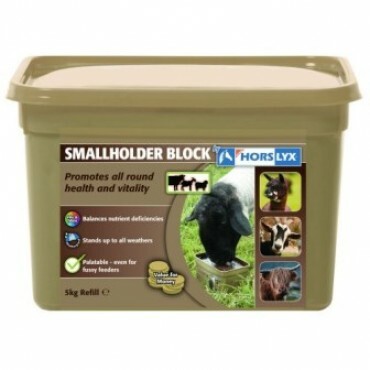 Smallholder Block is a free access, highly palatable and weather proof lick that encourages a natural, trickle feeding grazing pattern and balances the nutrient deficiencies in modern forage and grazing. Smallholder Block is a palatable, high energy, mineralised feed lick which provides a concentrated source of sugar which is important to help maintain rumen digestive efficiency, since grass sugar levels fall dramatically both after dull, wet weather and as the grazing season progresses from summer into autumn. Sugar is vital for optimum forage digestion in ruminants.